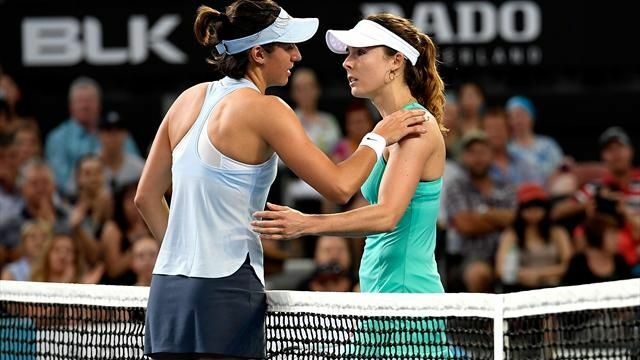 Fourth seed Caroline Garcia left the court in tears after a lower back injury forced the Frenchwoman to retire from her first round match against Alize Cornet at the Brisbane International on Sunday. The 24-year-old, who struggled with a back injury last season, claimed the first set 6-3 before Cornet prevailed by the same score in the second to force the decider in the all-French encounter. Garcia appeared to be suffering from some discomfort and took a medical timeout before the final set. She tried to hit a couple of serves before deciding she could not continue and retired in tears. Cornet will met Mirjana Lucic-Baroni in the second round after the Croatian, who travels full-time with her daughter, overcame Germany’s Tatjana Maria 6-4 4-6 6-0. “I’m very sorry for Caroline. I know what it’s like to have back pain,” Cornet, who went down to Karolina Pliskova in last year’s final, said in a courtside interview. Elsewhere, seventh seed Anastasija Sevastova beat local favourite Sam Stosur 6-1 6-3, while Ana Konjuh tamed Kiki Bertens 6-1 6-2. In the men’s section, Ukraine’s Alexandr Dolgopolov caused a minor upset with a hard fought victory over sixth seed Diego Schwartzman of Argentina 6-4 7-6(3).